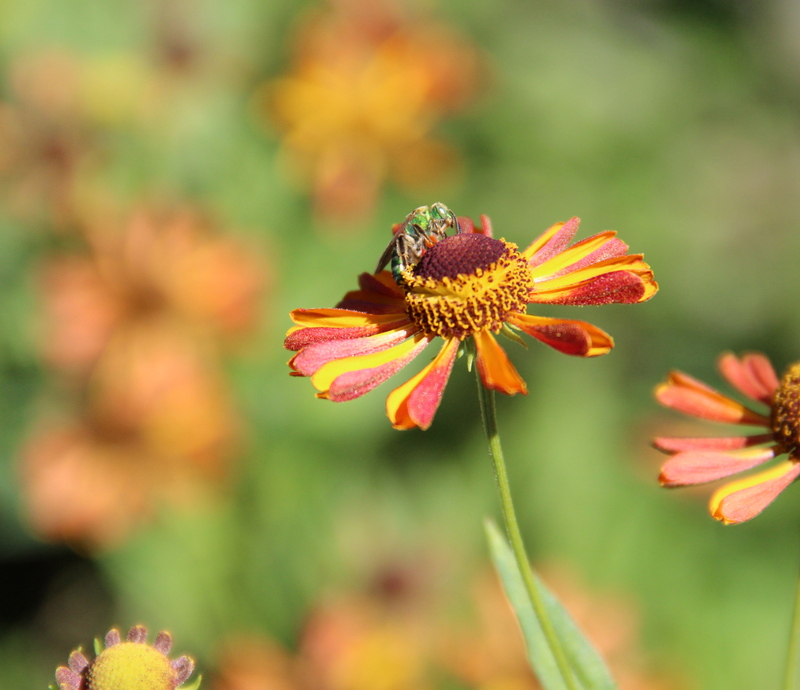 A metallic green bee (Agapostemon) drinks nectar from a Helenium flower. A female metallic green bee searches for nectar in a Jerusalem Artichoke (Helianthus tuberosus L.). 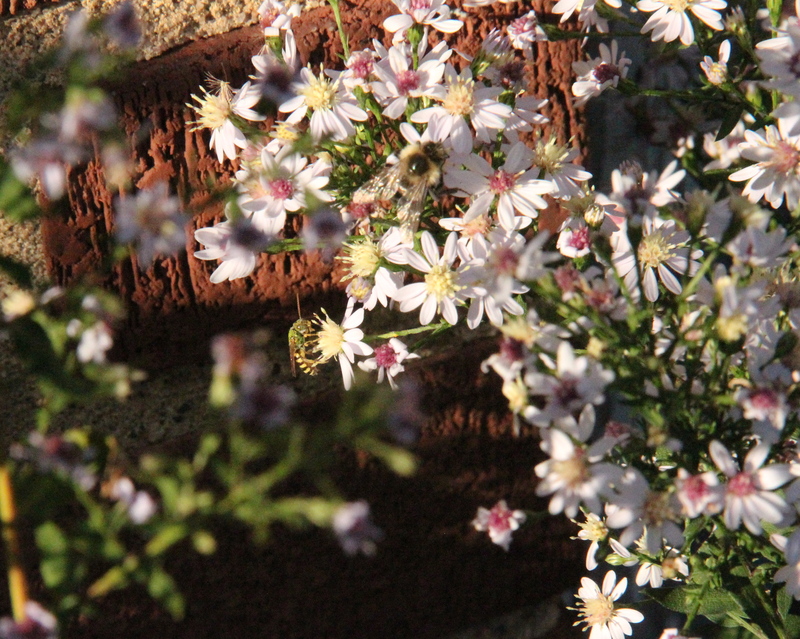 Bees of many kinds visit our backyard garden on sunny autumn afternoons — and not all are black and yellow! I think one of the prettiest is the metallic green bee, which is a type of tiny sweat bee in the (family Halictidae). The female bee’s body is usually a beautiful iridescent green. The male bee has a bright green head and thorax, but in contrast to the female, he sports a vibrantly striped abdomen — black with yellow or white stripes. Native heath asters (Symphyotrichum ericoides) are a favorite of metallic green bees. Metallic green bees, typically just a few eighths of an inch in size, are small in comparison to many backyard bees, such as bumble bees and honey bees. They are short-tongued bees, so they prefer to drink nectar from flowers that have a more shallow, open structure. In our yard they prefer Helenium and asters. Unlike colonial bees that live in hives, each adult female green bee creates her own underground nesting chamber in which she lays her eggs. Sometimes, several females construct individual nests near each other, but they remain solitary. When cold weather arrives in late October, the male green bees die. Fertilized females survive because they form a layer of insulating fat and burrow into the ground to overwinter. Next spring, they will lay eggs in new underground nests and continue the life cycle. Most years, green bees should be visiting your garden by the end of April. 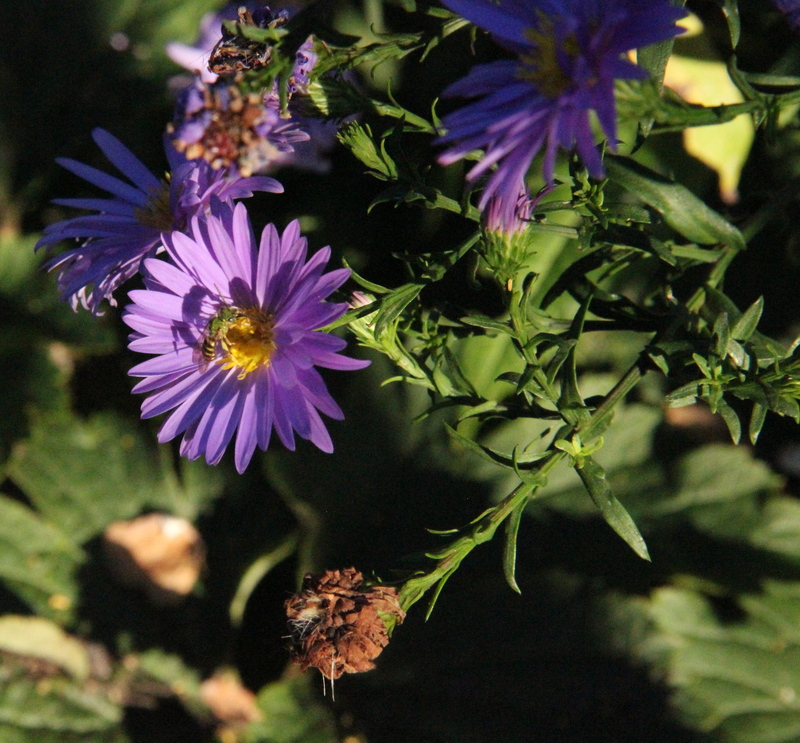 A male green bee catches the warmth of the late afternoon sun on an aster (Symphyotrichum novi-belgii). 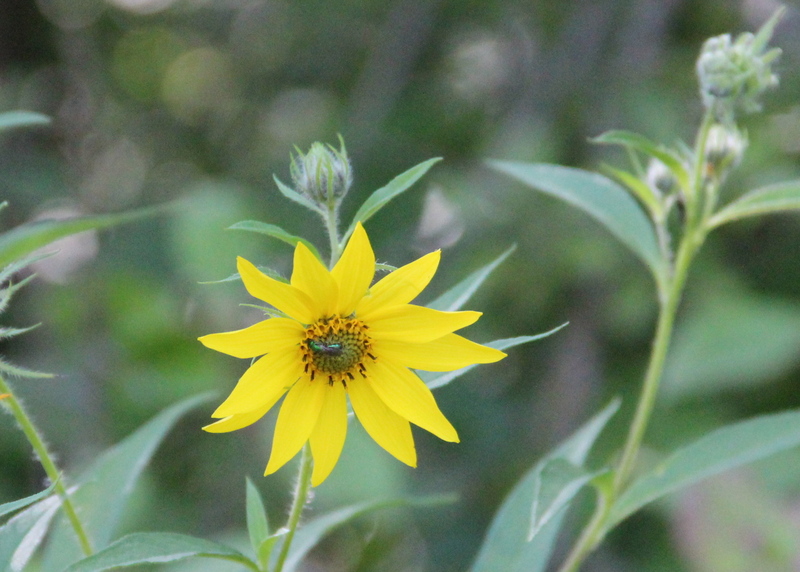 This entry was posted in Autumn, Backyard Nature, Garden, Native Bees, Nature Photography, Phenology, Saint Paul, MN and tagged Agapostemon, Halictidae, Helenium, metallic green bee, Sweat bee. Bookmark the permalink.